ARRL Southeastern Division Vice Director Andrea Hartlage, KG4IUM (seen here at the AM station in the ARRL Lab's museum room), resigned from the ARRL Board of Directors on August 1. ARRL Southeastern Division Vice Director Andrea Hartlage, KG4IUM, announced that she has resigned her position from the ARRL Board of Directors, effective August 1. Hartlage -- who graduated from the Georgia Institute of Technology in May -- will be moving to the Washington, DC area to begin her career. The ARRL Articles of Association require that a Director or Vice-Director must reside in the Division. ARRL President Kay Craigie, N3KN, has appointed James Millsap, WB4NWS, of Acworth, Georgia, to fill the vacancy, also effective August 1. Millsap, who has a background serving in the ARRL's Georgia Field Organization, currently serves as the ARRL Metro Atlanta District Emergency Coordinator. "I want to make it clear that while I will no longer be a member of the Southeastern Division or a Board member, I plan to remain involved in ham radio and to continue serving the Amateur Radio community," Hartlage told Southeastern Division amateurs. "I will continue to be an active member of the Youth in the Second Century Committee, will continue to help the ARRL staff and Board in any way possible and look forward to becoming an active member of the Roanoke Division." Read more here. The ARRL Board of Directors met July 20-21 in Windsor, Connecticut for its 2012 Second Meeting. The Minutes of that meeting have now been posted on the ARRL website. This feature is a concise monthly update of some of the things that the ARRL is doing on behalf of its members. This installment -- which covers the month of July -- takes a look at the 2012 Second Meeting of the ARRL Board of Directors, an ARRL-sponsored webinar on hurricane response, an interview on ham radio with an astronaut, W1AW services, integration of the ARRL's LoTW program with CQ's WPX Award, reports from the Official Observer Desk and more. Read more here. Saying that it believes that the Amateur Radio Service "allows flexibility to provide emergency communications in a way that takes into account channel availability and other local conditions," the FCC denied a Petition for Rulemaking on July 31 that sought to create a nationwide emergency calling frequency. 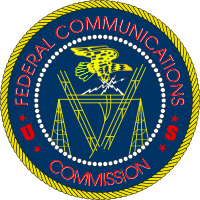 The Petition -- filed by Bryan Boyle, WB0YLE, of Morrisville, Pennsylvania, and Jim Dixon, WB6NIL, of Alhambra, California -- called upon the FCC to designate 146.550 MHz as a "non-exclusive nationwide Amateur Radio Service emergency communications channel using FM wideband modulation." Read more here. After a Merced, California man refused to let FCC investigators inspect his Citizens Band (CB) radio station, the FCC issued -- and upheld -- a Notice of Apparent Liability for Forfeiture (NAL) for $7000 for not allowing the inspection. In issuing the NAL in March 2011, the FCC found that Ira Jones "apparently willfully and repeatedly" violated Section 303(n) of the Communications Act of 1934, as amended, and Section 95.426(a) of the Commission's rules (CB Rule 26) by failing to permit the inspection. Jones responded to the NAL, but the FCC upheld the forfeiture amount, saying that Jones' arguments were "irrelevant" and "unpersuasive." Read more here. Former Serbian Internal Affairs Minister Ivica Dacic, YU1YU, was elected as that country's newest Prime Minister on July 27. He succeeds Mirko Cvetkovic, who served as Serbia's Prime Minister from 2008-2012. Dacic is the leader of the Socialist Party of Serbia; from 2008 until his election as Prime Minister, he served as First Deputy Prime Minister, as well as Minister of Internal Affairs. In March 2012, Serbia became a candidate for membership in the European Union (EU). 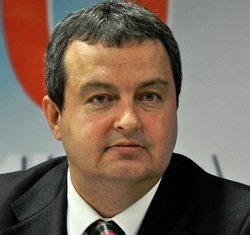 Dacic is a member of the Amateur Radio Union of Serbia (SRS), Serbia's IARU Member-Society and is said to be a member of his local club, YU1AAV. The club was founded in 1978 as one of nine sections of the Novi Beograd (New Belgrade) Amateur Radio Club, YU1FJK. According to its website, YU1AAV's primary goal has been to teach kids Morse code and Amateur Radio Direction Finding skills: "The 1990s brought us war, sanctions and social crises, but it also brought the good opportunity to move kids from the streets to learn ham radio. These were the years when the most kids from the neighborhood finished the course to get their basic ham license." Boban Kojic, YT9A, told ARRL Chief Executive Officer David Sumner, K1ZZ, that he was "happy that Ivica had become a ham and had passed his telegrapher's class. It is exciting that today's Prime Minister passed his second class exam in high school and has supported his club throughout the years. I first met Ivica at the 2005 Region 1 ARDF Championships in Tara, when I was SRS President. He helped to gather funds for the event, and together, we went from ministry to ministry in search of financial support. Ivica himself called the president of Bajina BaÅ¡ta [a town located in the western mountains of Serbia where the opening ceremony would be held] and sought his assistance to fund the opening ceremony. Now this wasn't a small amount of money; it was money for the buses from Tara to Bajina BaÅ¡ta and back, the renting of a stadium, cleaning and decorating, organization of about 15-20 minutes of cultural and arts programs and cocktails for representatives of the national associations, as well as gift bags for each and every one of them." 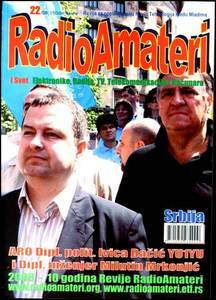 In 2008, Dacic was featured on the cover of Radio Amateri, a Serbian Amateur Radio magazine. In another e-mail to Sumner, Ivan Mastilovic, YU1LA, said that while he has not heard Dacic on the bands, "it is probably because his job takes all his free time. I have met him a few times with the SRS and he is a very nice young man with a real interest in Amateur Radio. No doubt that when his political career ends, he will be on the air more with a true love for ham radio. Now, as our Prime Minster, I'm sure he can help our ham radio community." Two British special event call signs have been activated to celebrate the London 2012 Olympic and Paralympic Games: 2O12L from London, England and 2O12W from Barry, Wales. Both stations will be on the air for the duration of the Games -- July 25-August 12 -- and continuing through September 9. Organizers hope to make at least 80,000 contacts during the seven weeks that 2O12L and 2O12W are on the air. Read more here. The Sun, as seen on Thursday, August 2, 2012 from NASA's SOHO Extreme Ultraviolet Imaging Telescope. This MDI (Michelson Doppler Imager) image was taken in the continuum near the Ni I 6768 Angstrom line. The most prominent features are the sunspots. This is very much how the Sun looks in the visible range of the spectrum. 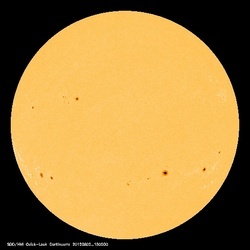 Tad "I'm up before the Sun" Cook, K7RA, reports: The average sunspot numbers this week were up more than 47 points to 99.3, while the average daily solar flux rose nearly 35 points to 131.7. The solar flux jumped from 139.8 on Tuesday, July 31 to 150.1 on Wednesday, August 1. The predicted solar flux is 155 on August 2-3, 150 on August 4, 145 on August 5-6, 140 on August 7, 135 on August 8-9, 140 and 130 on August 10-11, and back down to 120 on August 12-13. The solar flux is expected to drop below 100 on August 16-21. The predicted planetary A index is 10 and 8 on August 2-3, 5 on August 4-19, 8 on August 20-21, 5 on August 22-23, and then 8, 8, 12 and 8 on August 24-27. Look for more on the ARRL website on Friday, August 3. For more information concerning radio propagation, visit the ARRL Technical Information Service Propagation page. This week's "Tad Cookism" is brought to you by DEVO's Working in a Coal Mine. Steve Powlishen, K1FO, of Madison, Connecticut, passed away July 28 due to complications from cancer. He was 60. 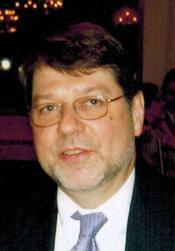 An ARRL Life Member, Powlishen was best known for his antenna designs for weak signal work. His company, Lunar-Link Systems -- founded by Powlishen in 1994 -- manufactured and sold high-performance amplifiers that allowed more amateurs to experience Earth-Moon-Earth (EME), often called "Moonbounce," on 432 MHz. Powlishen -- who had 613 unique contacts on 70 cm EME -- penned more than 10 articles for QST, QEX and Ham Radio Magazine on weak signal operation. Read more here. 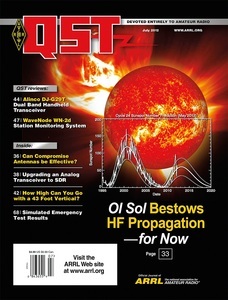 The winner of the July QST Cover Plaque award is Carl Luetzelschwab, K9LA, for his article "Our Recent Solar Minimum and Sunspot Cycle 24 Progress." Congratulations Carl! The QST Cover Plaque award -- given to the author or authors of the best article in each issue -- is determined by a vote of ARRL members on the QST Cover Plaque Poll web page . Cast a ballot for your favorite article in the August issue today. With the recent upgrades to the ARRL's Internet system completed, the W1AW EchoLink Conference Server W1AWBDCT and W1AW's IRLP Node 4292 are now back in service. Amateurs are able to once again listen to code practice transmissions and digital bulletins via the W1AW EchoLink Conference Server.